Use with chocolate or mold ice cream to dip for the TV addict in your life. 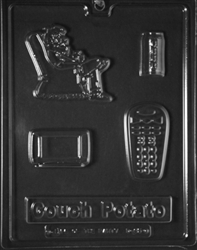 Contains dad in his easy chair, a TV set, remote control, beer can and Couch Potato Sign. 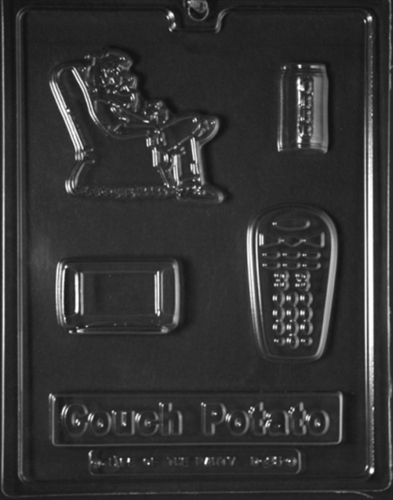 Piece sizes: Man 3" x 3-1/2" x 3/8", Remote 3" x 1-1/2" x 3/8", Sign 1" x 5-7/8" x 5/16"
Beer 1-3/4" x 7/8" x 1/2", TV 2-3/8" x 1-1/2" x 1/5"